Use this category any time you post a recipe on the website. 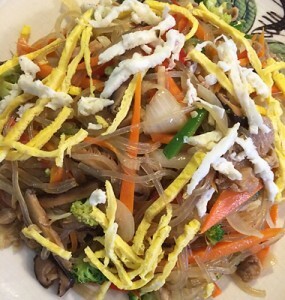 Originally created for a king, this mixture of vegetables, glass noodles and (in this case) pork has become a mainstay of the Korean kitchen. It can be served hot or at room temperature. 1. Soak dry noodles in warm water for one hour. Bring water to a boil and cook 8-10 minutes until “soft and slippery,” not al dente. Cut into smaller lengths with a scissors, add 3 Tbs. soy sauce to coat, mix well, reserve. 2. 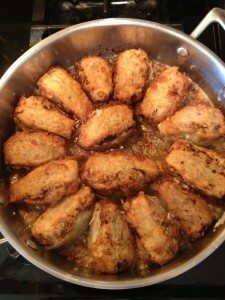 Place dried shiitakes in a small sauce pan, cover with water, bring to boil, and let steep until soft. Strain, reserving water for another use. Trim stems and discard. Julienne mushroom caps and add 5 Tbs. soy sauce. Mix well, reserve. 3. Combine pork, garlic, 2 Tbs. sesame oil and remaining 5 Tbs. soy sauce, mix well, reserve. 4. Whisk separated eggs well and cook each as you would an omelet. Julienne, reserve. 5. 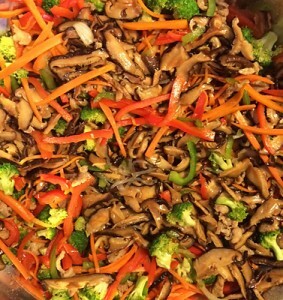 Stir-fry each vegetable individually in scant olive oil to wilt/soften, maybe 2 minutes, then season with salt and pepper, let cool, and combine in large bowl. 6. Stir-fry pork, season and let cool, then combine with vegetables. 7. Stir-fry noodles, combine with pork and vegetables. 8. Drizzle remaining 2 Tbs. dark sesame oil over mixture. Adjust seasonings to taste and garnish with the julienned yellow and white omelet. 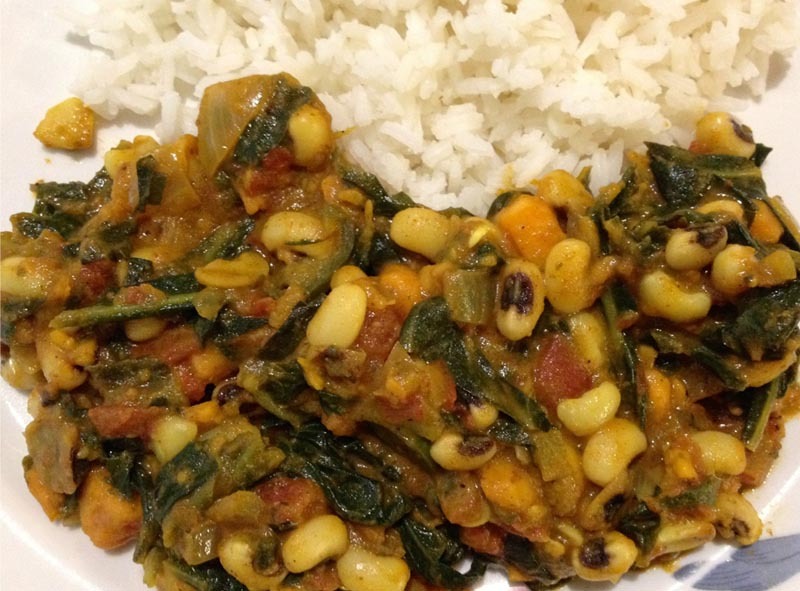 *Spinach is traditional, but Un Hee Han doesn’t like it so she substitutes broccoli. Up to you. A working-class dish traditionally served at weddings, this mung bean, pork and kimchi pancake is an example of the North Korean style, with beans and kimchi instead of flour and seafood as in the South. 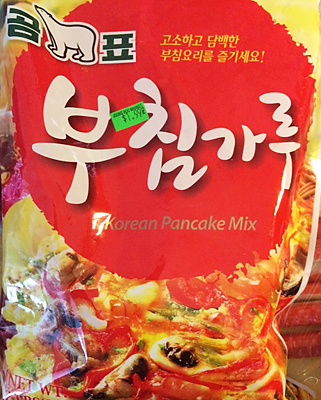 Most often it’s washed down with an unfiltered rice wine called makgeolli–a favorite of farmers and, these days, rappers. Besides that, it’s Un Hee Han’s daughter’s favorite comfort food. 1. Place mung beans in a bowl. Wash repeatedly until water runs clear and bubbles disappear, maybe 5-6 times. Cover with about 1 inch of water (Un Hee Han uses the top joint section of her index finger to measure). 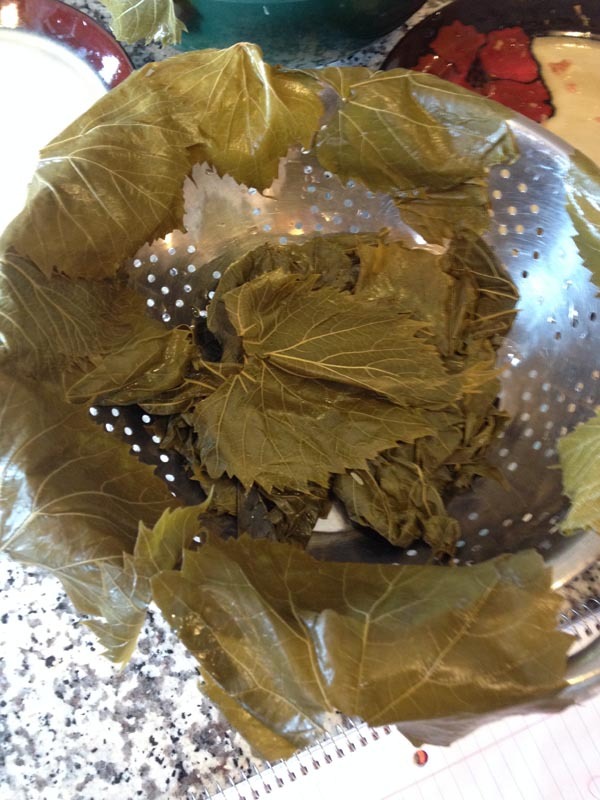 Let soak 4 hours. Strain and puree in small batches until smooth, adding some of the soaking water to reach a light batter consistency. 2. Mix all ingredients together. In well-oiled small skillet, ladle 4 oz. 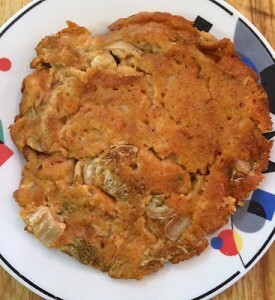 of batter (about 4 inches in diameter and 1/4 inch thick) and sauté in batches over medium-low heat until it solidifies and browns around the edges, 5-7 minutes. Flip and repeat. Makes 10-12 pancakes. This is an adaptation of a couple recipes that Craig and his girlfriend Laura like, and so includes both shredded and mashed potatoes. 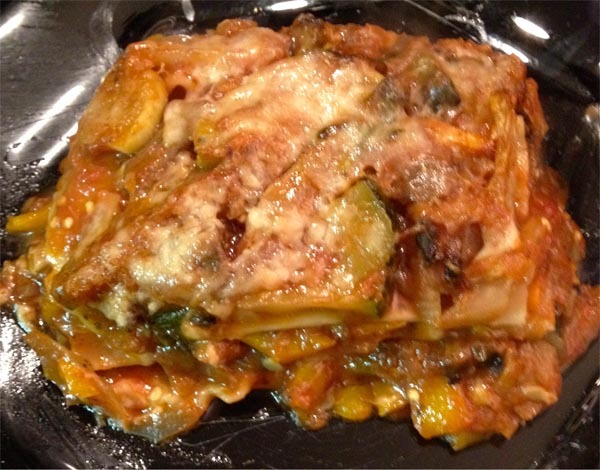 Feel free to play around with it as well–maybe add some bacon and scallions or change the cheeses up. 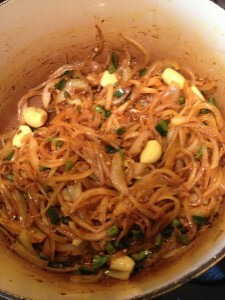 Or use fresh shredded potatoes and fry your own onions instead of the firemen’s favorite: frozen and canned. *NOTE: If you use the stuffing mixture, melt an additional 1/2 cup butter and drizzle it over 1 cup of stuffing mixture to coat. Reserve. 1. 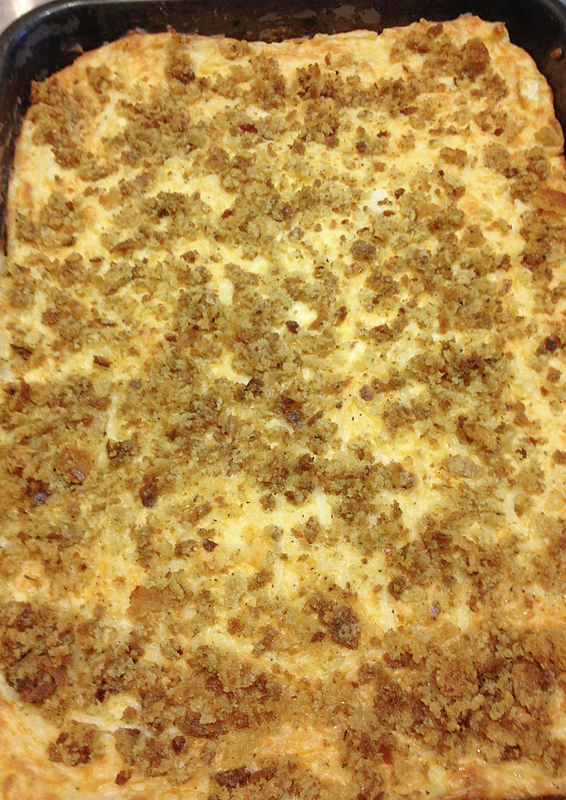 In a large bowl, add hash browns, onion, salt, pepper, 1/2 (8 oz) of the sour cream, and the cheddar cheese. Mix well, reserve. 2. Boil potatoes in salted water about 20 minutes (or until tender). Drain well and mix with 1/2 cup butter and cream cheese. Mash thoroughly. 3. Add remaining sour cream and whip until smooth and creamy. Salt and pepper to taste. 4. Add to reserved potato and cheese. Mix well. 5. 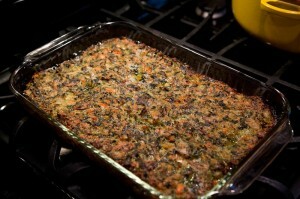 Place in 9” x 13” casserole and spread until even. 6. Top with fried onions or the stuffing mixture. 7. Bake at 350 degrees for 45 minutes. *This step is omitted at the firehouse, as wine is frowned upon, but at home . . . salute! 2. Brown neck bones in large skillet with enough olive oil to coat pan. Reserve and repeat with Italian sausage and then, the meatballs. 3. Deglaze pan with Chianti, reduce by 1/2 and pour over reserved meats. 4. Sauté garlic in remaining oil over medium-high flame until golden brown, stirring throughout. Do not burn. 5. Add the tomato paste, basil and oregano and mix well. Reserve. 6. 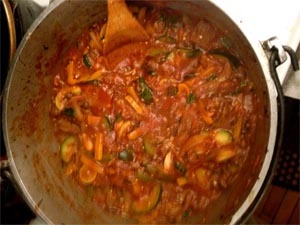 In a large, heavy-bottomed stockpot, combine crushed tomatoes with reserved meats and their juices, mixing well. Bring to boil, remove from stovetop and place in oven for 3 hours, stirring often to prevent burning on the bottom of the stockpot. 7. Adjust seasonings as you see fit. 1. 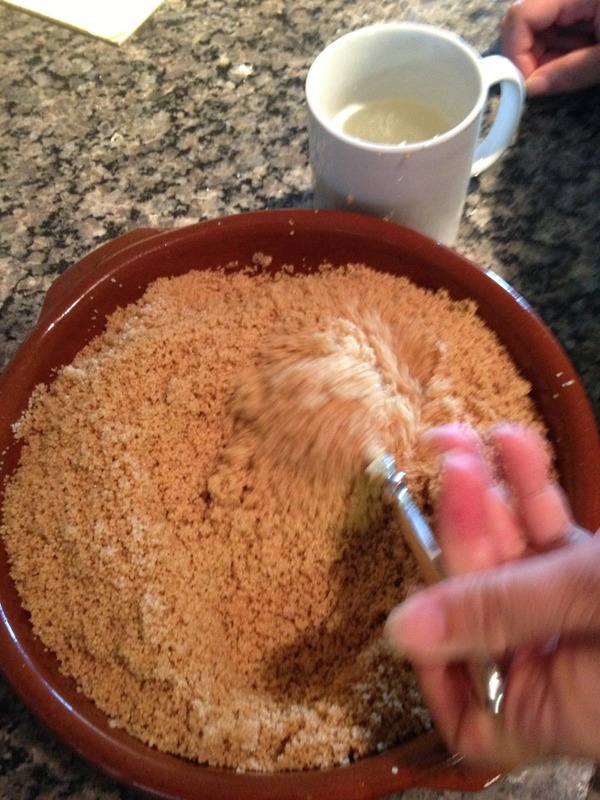 Combine garlic, bread crumbs, parmesan cheese, salt and pepper. Reserve. 2. 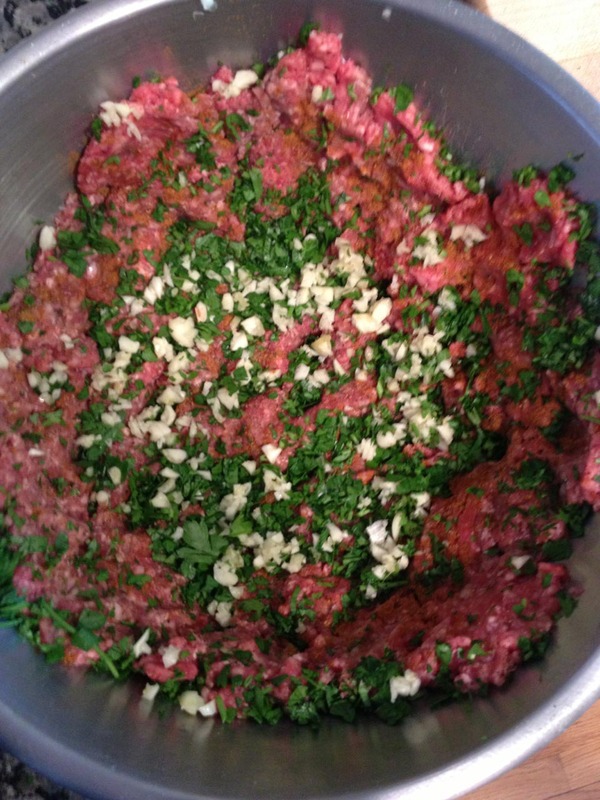 Mix beef, pork, parsley, eggs and milk lightly by hand and combine with the above. Form into balls. 3. Heat oil in a large skillet over medium-high heat. 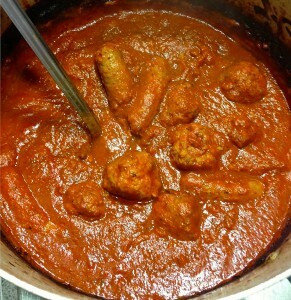 Brown meatballs on all sides and add to Sunday Gravy stockpot. 1. Cut oranges into 8 sections; make sure the membrane is removed. 4. Start by placing oranges at the bottom of a glass. 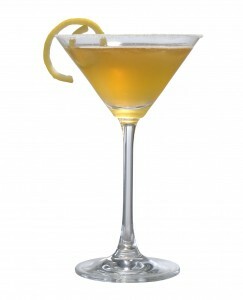 Alternate by adding a layer of bananas and then a layer of pineapple. 5. Mix in maraschino cherries and top with coconut. 1. Preheat oven to 325° Fahrenheit. 2. Mix all ingredients together for 10-15 minutes. Pour batter into a greased and floured tube pan. 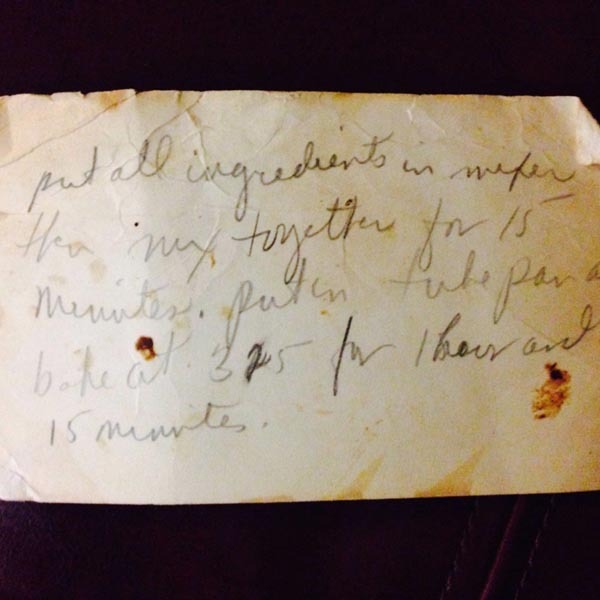 Bake for 75 minutes. 1. Boil 2 quarts of water in a large pot. Add salt and collards. Cook for seven minutes. Drain. Squeeze all of the excess water out. Rough chop. Set aside. 2. Heat small skillet over medium heat. Add dry spices to hot skillet. Shake pan to make sure spices don’t burn. Adjust heat, if necessary. Spices should darken and your kitchen should smell like a marketplace (about 2 minutes). Remove skillet from heat. 3. In large pot (use the same one you used for the collards) heat 3 T. of oil until glistening. Add sweet potatoes and onions; stir to keep them from sticking to the pan. Cook until everything is golden and there are crunchy bits on the sweet potato (approximately 8 minutes). 4. Reduce heat to medium. Make a well in the center of the pan and add the rest of the oil, garlic, ginger, rooster spur peppers, and tomato paste. Stir the ingredients. Add curry powder and garam masala and cook an additional minute (you want the flavors to bind). 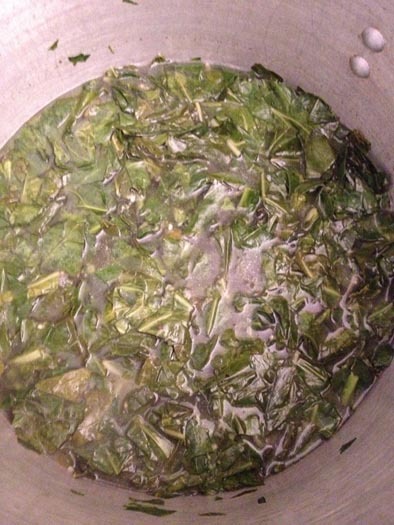 Add collards and stir until all items in the pot are incorporated with spice. 5. Finally, add diced tomatoes, 1 cup of water, black eyed peas, and salt to taste. Raise heat to a boil, stir the bottom of the pan and loosen all of the browned spices and seasonings from the bottom (this takes a bit of elbow grease). Cook an additional 10 minutes. Add coconut cream and heat through. Serve with rice, or – if you are lucky enough to have some on hand – homemade lime pickle. 1. In a pan, heat 2 tablespoons of the oil on medium-high heat. Throw in the minced garlic and fry until golden brown. Remove from heat. 2. Heat the rest of the oil for 5 minutes. Take off heat, add chili flakes. It will bubble! 3. Allow to cool for 5 minutes. Add sugar, garlic, and salt. 4. Store in a jar and refrigerate for up to 3 months, or serve fresh with soups and noodle dishes. Persimmons abound in Midwestern farmers’ markets during the fall. One need not travel to Xi’an, nor set aside the practice of locavorism to eat shi zi bing. According to Purdue’s horticulture website, “Mature, hard, astringent persimmons can be stored in the refrigerator for at least a month. They can also be frozen for 6 to 8 months.” Alternatively, one can process the ripe fruit and freeze the purée for up to a year. To be palatable, most persimmons should be dead-ripe. To hasten the process, wrap the fruit in paper or enclose along with apples or pears to encourage the development of ethylene, the natural ripening agent. Allow the Hachiya variety to soften and become wrinkly. This mitigates the astringent quality of its flesh. 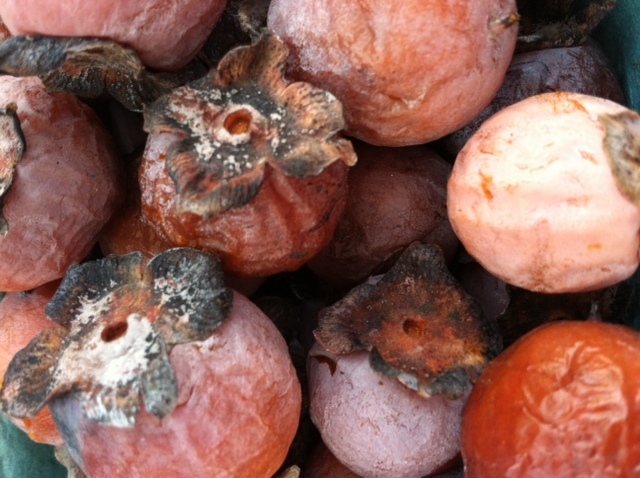 The Fuyu persimmon is sweeter than the Hachiya, and has a complex floral aroma. 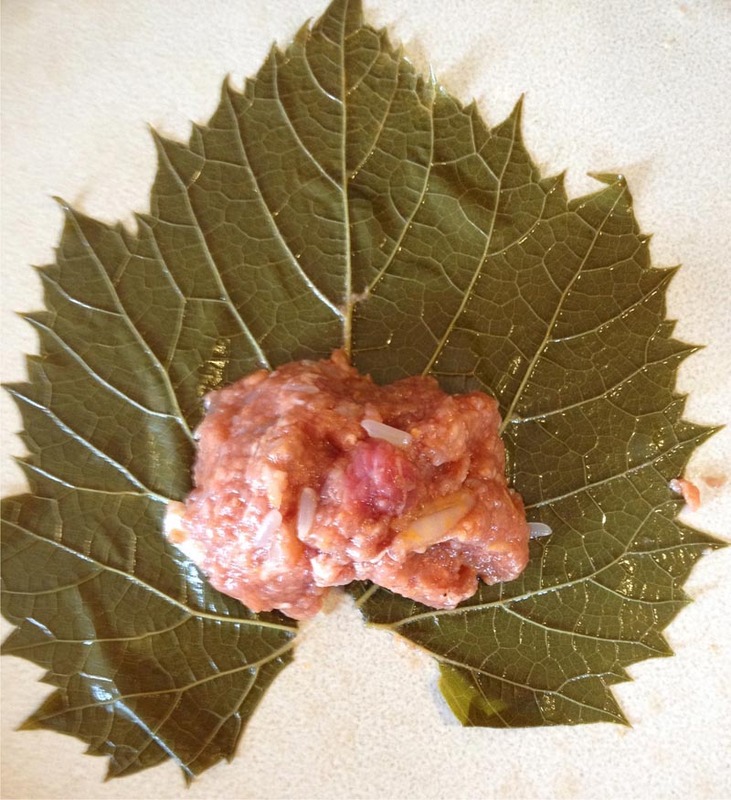 The Fuyu does not need to be mushy to be eaten. A fresh persimmon weighs about 168 grams. For an authentic taste of Xi’an, snack on some dried persimmons while you make the cakes. I found dried persimmons in my local Korean grocery, where I asked for gotgam and was directed to the freezer section. 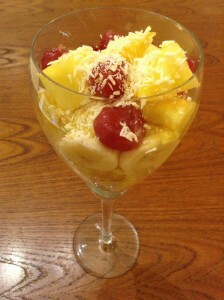 The fresh and dried fruits can be found in Japanese groceries as hoshigaki and Vietnamese groceries as hồng khô. Allow the frozen persimmons to stand at room temperature for 20 minutes, and you will find them to be softer than most dried fruit. 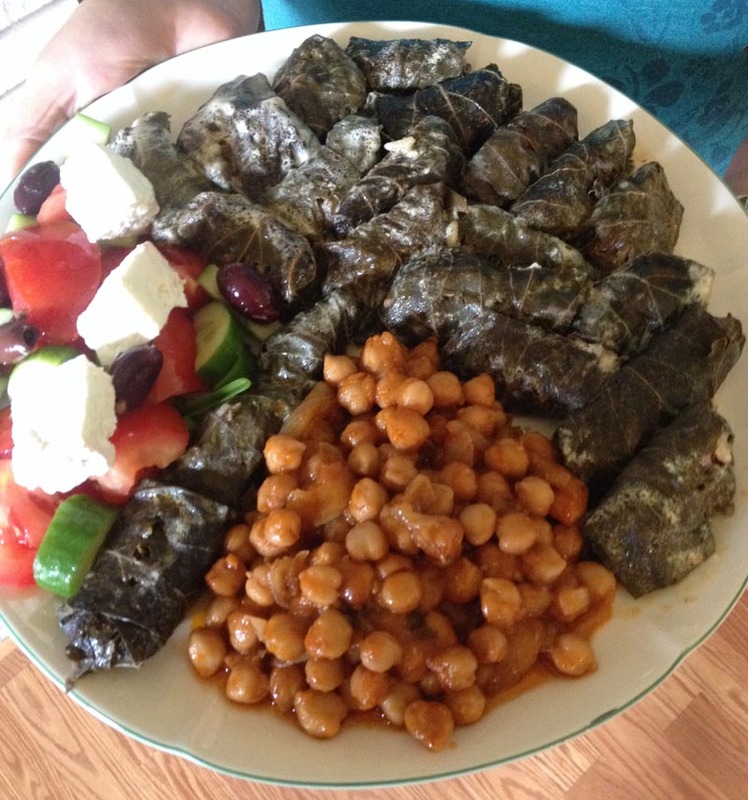 I adapted both amounts of ingredients and directions from this recipe on the website of Australia’s multi-cultural Special Broadcasting Service. 1. Make the walnut filling. Combine rosewater and sugar, adding enough water to form a dryish paste. Toast walnuts over low heat in a small skillet just until you begin to smell them, before they begin to color. Combine walnuts and sugar mixture and set aside. 2. Make the dough. Combine persimmon purée and flour in a bowl to achieve a wet, sticky dough such as one for drop biscuits. The dough will look glossy. 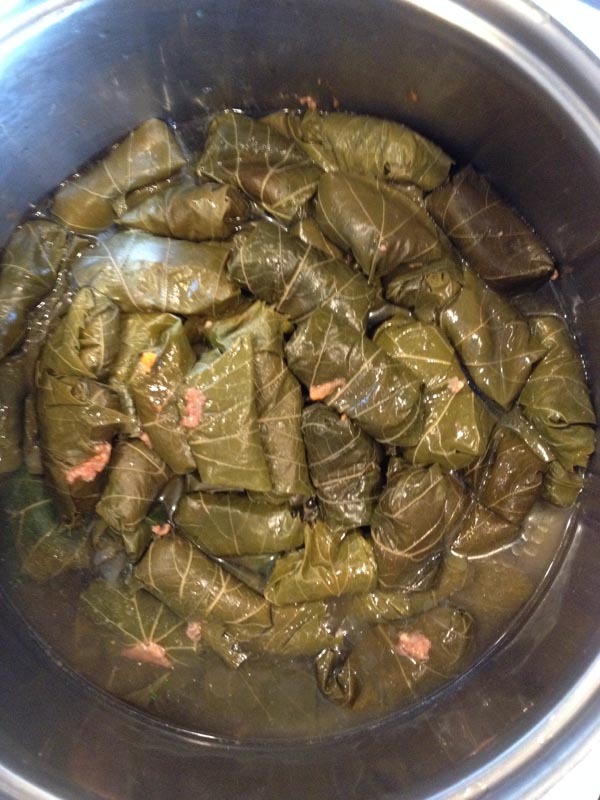 Cover bowl with plastic wrap and set aside for at least ½ hour in refrigerator. 3. Form the cakes. Very generously flour a board or other work surface. Gather dough from bowl, and drop in one piece onto floured surface. The dough will be very soft, but the additional flour will allow it to be manipulated and fashioned into a log the thickness of a rolling pin, about 2″ in diameter. 4. With a sharp knife, cut the log into 10 pieces. 5. 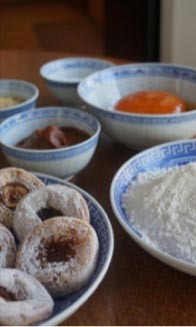 Form the cakes by gently rolling each piece out into a circle 3 inches in diameter, as you would a dumpling skin. Sprinkle a bit more flour on the piece of dough if necessary to prevent sticking (use the side of a glass as I did, a small rolling pin, or dowel, if you have one.) Press the edges of each round with your fingers to make it slightly thinner at the edges. 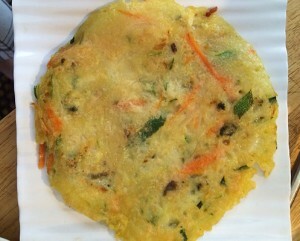 Depending on how much flour adheres to each round of dough, you may need to wet the edges as you would a dumpling wrapper, in order to close them properly around the filling. 6. Place into the center of each round of dough about ½ t. of the walnut mixture. 7. Enclose walnut filling by bringing edges of dough together in center as you would for a soup dumpling, but without the fancy folds. Press to seal. The cakes will be shaped like little domes at this point. They will flatten as they cook in the oil. 8. Set prepared cakes on floured board. Repeat process with remaining dough and filling. 9. Fry the cakes, First, pour canola oil into a large skillet over medium-low heat. 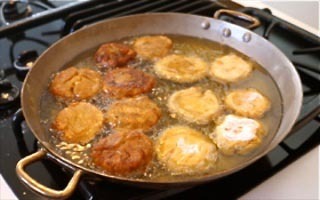 The level of the oil will rise when you have filled the skillet with the cakes, so start off with about 5/8″ of oil. Heat oil over medium heat. 10. Load a spatula with a single cake. Carefully slide and push cakes off end of a dry spatula with a wooden spoon into hot oil, taking care not to splash. Add more cakes to fill pan. 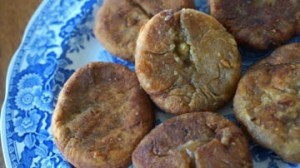 The cakes should not be submerged in the oil; the surface of each cake should be above the oil. 11. As cakes begin to cook, press them down gently with your spatula. They will slowly turn a beautiful golden orange color. If they begin to brown, the oil is too hot. Regulate the heat so that the cakes cook thoroughly but slowly. After about 5-7 minutes, turn each cake with tongs, to cook on the flip side. 12. In another 5-7 minutes, test one cake to see if the center remains light yellow in color, or whether it has darkened slightly to the dark golden shade of the cooked exterior of the cake. This indicates doneness. DO NOT TEST DONENESS BY TASTING NOW! The molten sugar-walnut center will be palate-scalding hot. 13. As cakes begin to look uniformly done, but before they brown, remove to drain on paper towels. Wait at least 5 minutes, and test for temperature before you eat them. To make 1¼ cups of persimmon purée, purchase 3 Hachiya or 5 Fuyu persimmons. Depending on the size of the fruit, you may have some left over. 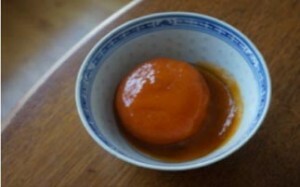 A medium-size ripe Hachiya persimmon weighs about 168 grams; a Fuyu weighs somewhat less, around 138 g.
The purée may successfully be frozen without a loss of flavor for up to a year. Though it may darken in color, this will not affect the taste or color of the finished cake. Josephine Hyde (Josephine) is a longtime contributor to LTHForum.com. 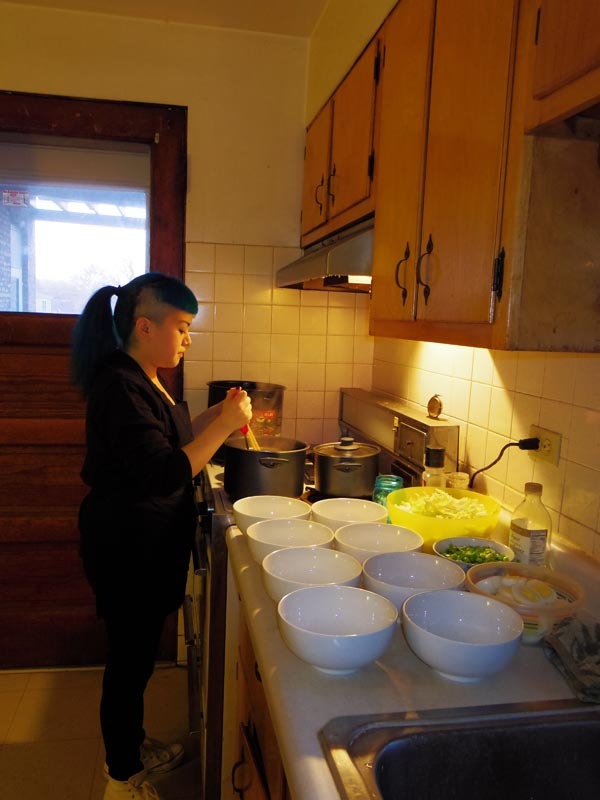 She believes that food is a portal to insight, connection, and joy. This one’s based on a recipe from “Charcuterie” by Michael Ruhlman and Brian Polcyn. 1. Completely dissolve the salts, sugar, honey and pickling spice in 1 ½ gallons of water. Do this over low heat if you have to, but these items will normally dissolve in cold water after some stirring (obviously, some elements of the pickling spice will not dissolve at all). Add the garlic. Stir until combined thoroughly. Add the ½ gallon of ice water to bring the temperature of the cure down. The cure must be cold (38° Fahrenheit or lower) in order for this to work properly and be safe. 2. Fully submerge the brisket in the cure. If it floats, you can keep it submerged by placing a non-reactive plate on top of it. Depending on the thickness of the brisket, leave it in the cure for 7-10 days, so that the cure penetrates to the deepest part of the brisket. Or, you can inject the cure into the center of those thick portions of the brisket and reduce the cure time to 3-4 days. IMPORTANT: If you used heat to make the cure, refrigerate it until it reaches temperature before adding the brisket. 3. After the brisket has cured fully, rinse it off completely. Pat the brisket dry. If you have time, place the cured brisket, uncovered – or wrapped in a single layer of cheesecloth – in refrigeration for 24 hours at (or around) 38° F. but do not freeze it. This extra step produces a pellicle, which allows the smoke to adhere to the brisket better. My experience is that it is not really necessary. 4. After the brisket is dry, lightly toast the black pepper and coriander seeds in a dry sauté pan. After they are toasted, grind them coarsely, mix them together thoroughly and rub the entire brisket with the mixture. 5. Hot-smoke the cured, rubbed brisket fat-side down at 200-250° F. for up to six hours over a wood of your choice: apple, hickory or oak are good ones. If you like it smokier, smoke it long but do not let the internal temperature of the brisket rise above 150° F. If it hits 150° F., remove it from the smoker. The key here is that if the pastrami gets to 150° F too soon, it will not have a lot of smokiness. There really is no downside to smoking it longer (or at a lower temperature) because the final step is a braise, which will cook the pastrami fully if smoking did not get it to that point. Just make sure you do not exceed 150° F. during the smoking process or the exterior of the meat will become dry and desiccated. 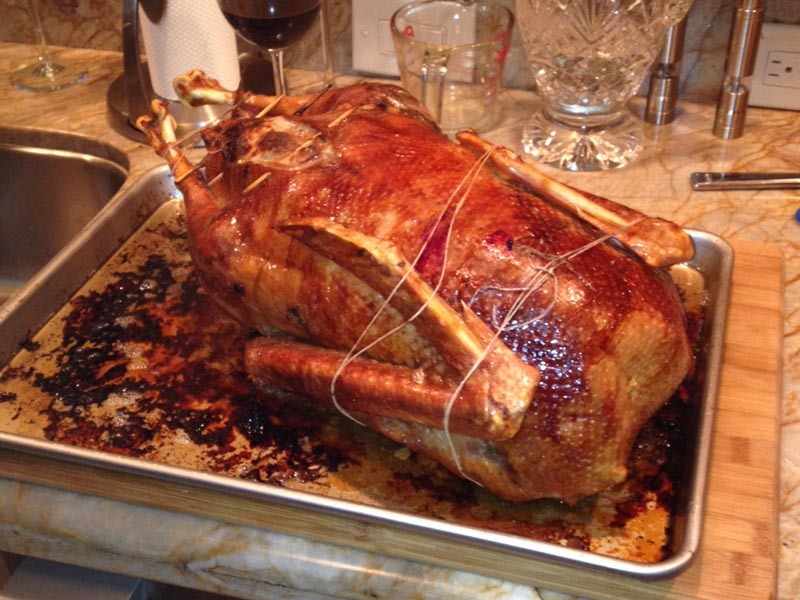 For restaurant applications, there may be other food-safety regulations that must be followed. 6. 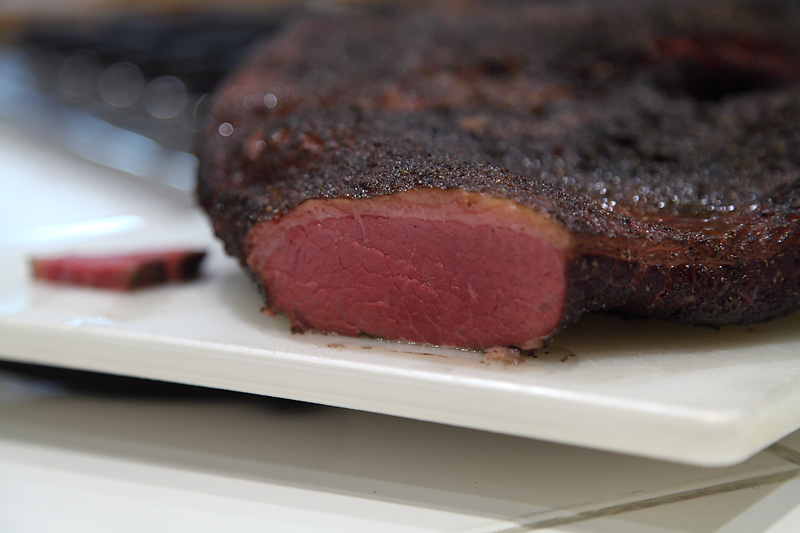 After the pastrami has received the desired amount of smoke or reached 150° F., it should be braised before serving. Braising will not only make it extremely tender but will also rid the meat of excess saltiness. I generally braise it for four hours at 275° F. Your mileage may vary. 7. After placing the pastrami in the braising vessel, I fill the vessel about halfway up the brisket with cold water. After about two hours of covered braising, I dump out 90 percent of the water, flip the brisket over, re-fill the vessel again to halfway up the brisket with fresh water, and continue to braise for another two hours. 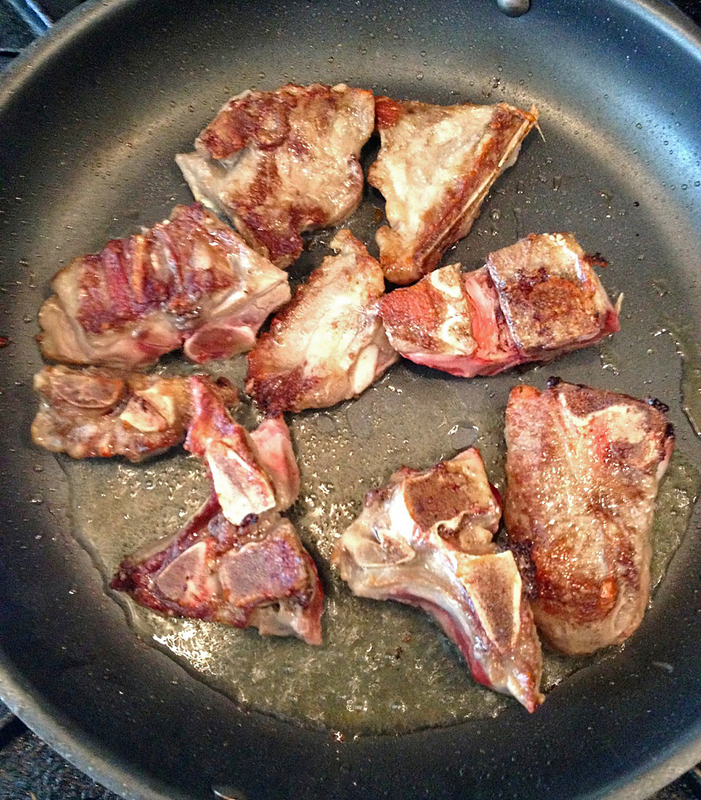 I find that it’s best to braise fat-side-down first and fat-side-up second. The pepper and coriander mix, if applied before smoking, will adhere to the brisket during braising. You’ll lose some of it but not enough to be a problem. 8. After the braise all you have to do is slice (against the grain) and serve. *Pastrami has an important, defining rub on the outside, so how you trim the brisket before you prepare it is important. You need some fat on the outside to protect it during the smoking process. 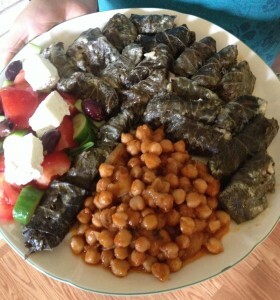 However, because the fat – which carries the black pepper and coriander – will ultimately be eaten, leaving too much on will result in a fairly unpalatable final product. 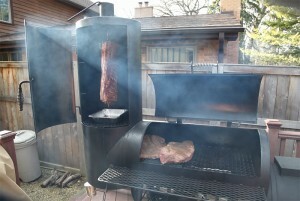 If you trim the fat after the smoking, you’ll lose the spicy crust that is key to a good pastrami. So, trim the brisket well before curing. I generally try to separate the point from the flat, leaving it attached. I also try to leave about ¼” of fat on the exterior of the brisket. **This recipe is scalable, depending on how much meat you use. However, the pink salt, which can be dangerous if used in excess, is not as adjustable. Use 1 teaspoon for up to 25 pounds of meat. If you use less than 10 pounds of meat, you might want to consider using even less pink salt. * a traditional Arabic spice blend common to Muslim and Sephardic cuisines. Available at The Spice House or most Middle Eastern markets. Allow yourself an entire day to make this dish. Start in the late morning and you can be eating by 7 p.m. 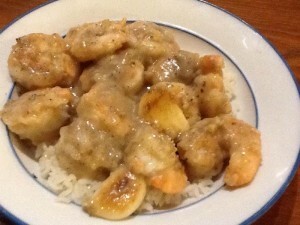 This recipe will serve 4-6 people and is easy to scale up for a crowd. Technically you could halve the recipe, but I’m not sure why anyone would – just invite more friends over for dinner! 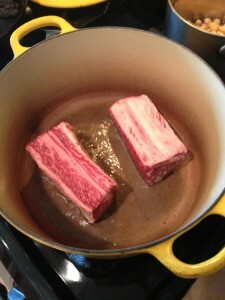 Season the short ribs and shanks generously with salt. Meanwhile, heat a large dutch oven over medium heat. Brown the beef short ribs and beef shanks in olive oil, working in batches so as to not crowd your pan and to achieve a deep brown color on all sides of each cut. Set aside on a platter while you create the flavor base for the stew. 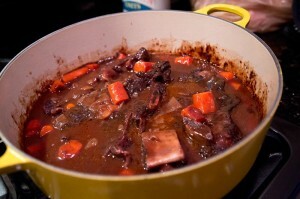 Traditionally, just the shank and maybe some neck bones would be used to flavor the stew. I like to add the short ribs to the recipe for the rich flavor and gelatin they add to the broth, as well as the succulent meat that results. It’s a luxurious addition to the final plate, but with or without them the dish will still be wonderful. If you don’t use ribs, just double up on the shanks. 2. In the same Dutch oven, sauté the onions in the beef fat, working to scrape up any brown bits from the surface of the pot. Add a pinch of salt to the onions to help them release their liquid. Add all the spices into the pot and stir to incorporate the spices into the oil. If the pot seems dry, add 1 T. of olive oil to moisten. Once the spices are fragrant, add the tomato paste and fry the paste until it has caramelized and turned a dark reddish-brown. Then add the rest of the aromatics: parsley stems, garlic, green pepper plus 1 T. salt, and sauté until softened. 3. Add 1 quart of chicken stock; scrape up all the bits from the bottom of the pan. 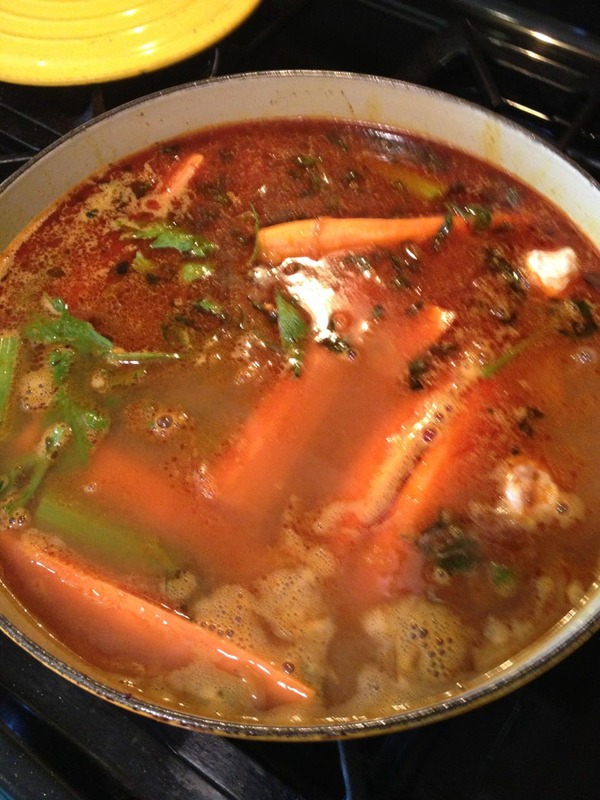 Add the two chicken legs, carrots, celery, browned beef shank, short ribs and any juices and fat that have dripped from the beef cuts back to the broth. Return to a simmer. While the stew is simmering you can make the boulettes – a sort of vegetable-wrapped oblong meatball that is breaded, fried and braised. 1. 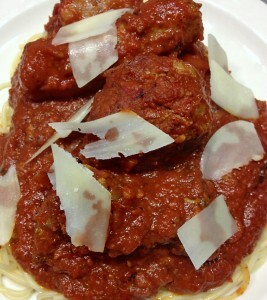 Traditionally, the boulettes are made with very coarsely ground or hand-chopped meat. I make them with high-quality ground chuck from the butcher. Keep two key things in mind when you are making the boulettes: first, make sure the meat is properly seasoned; second, do not overwork the meat. In order to accomplish this, take a large bowl and lightly press the ground beef into about a 1-inch layer all around the bowl. 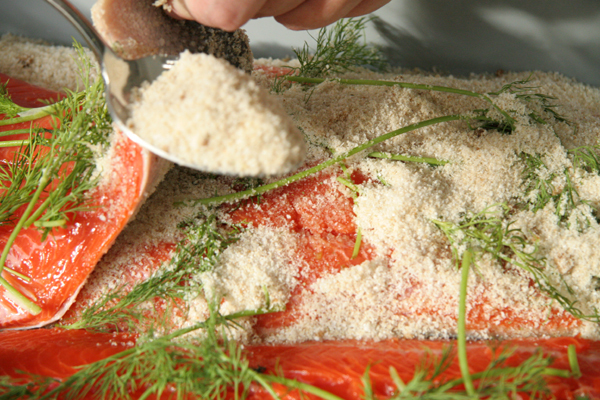 This way, as you add the seasonings, you have a better feel for what the correct amount should be. 2. 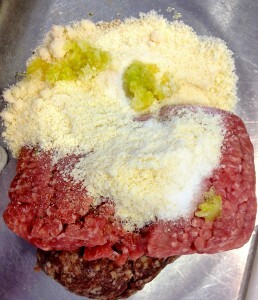 Add seasonings one at a time, evenly distributing the ingredients in layers over the meat. Start with salt, spices, garlic and parsley. Squeeze all of the moisture out of the soaked bread before adding to the meat. You’ll also want to remove all of the “water” from the shredded onion, too. 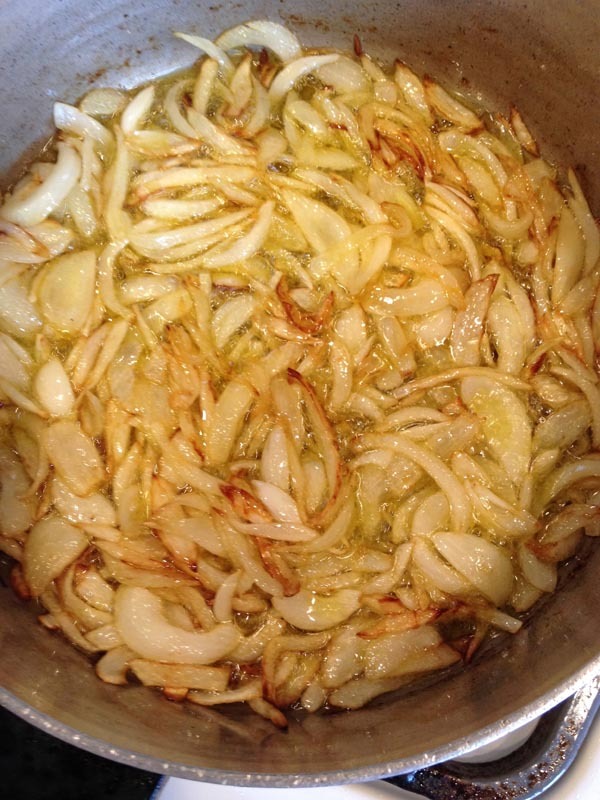 Don’t waste that onion water, though – squeeze all of the onion juice directly into the simmering stew for extra flavor. 3. 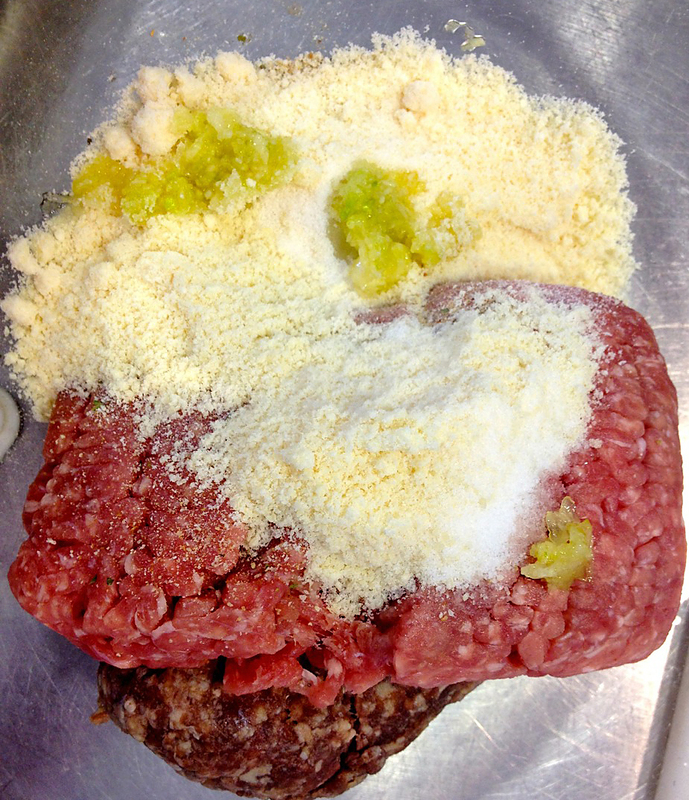 Add an egg yolk and combine the meat mixture thoroughly with your hands. Be careful to just combine the meat spices without over-mixing – otherwise, your final boulette will have an undesirably smooth texture. 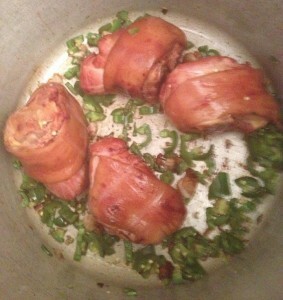 Take a small piece of the seasoned meat, microwave it for 10-15 seconds and taste it. Adjust seasonings as needed. As you’ll be braising in a flavorful and reduced broth, which will add additional salt, the meat should taste slightly under-salted. Cover and chill while you prepare the potato wraps. 4. 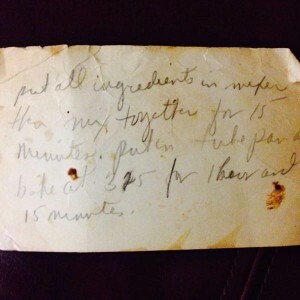 This recipe should yield 12-14 boulettes. These football-shaped meatballs are traditionally wrapped in some sort of thinly-sliced vegetable – like eggplant, onion, zucchini, or even celery. The preferred wrap in the the Lopata household was potato. The potato browns well, maintains structural integrity and is a great carrier of flavor. 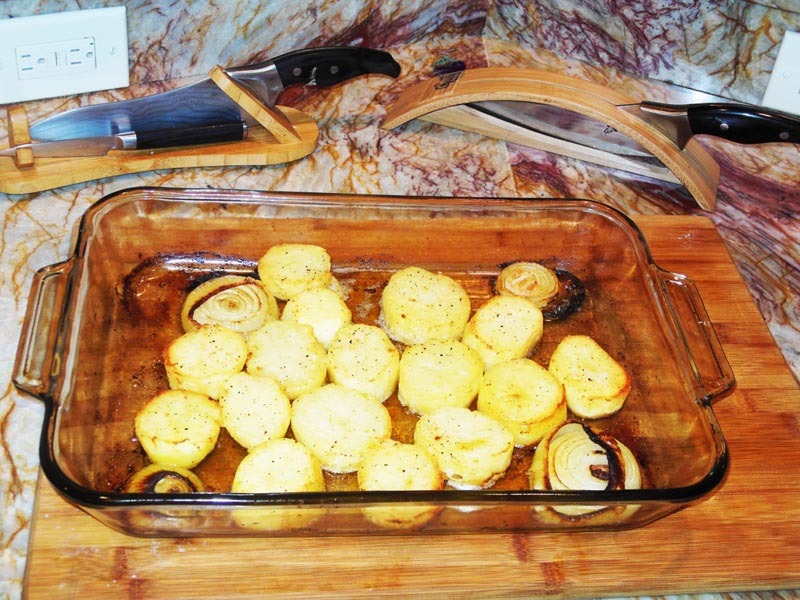 Meme and Coco would painstakingly carve each strip of potato by hand with a paring knife. 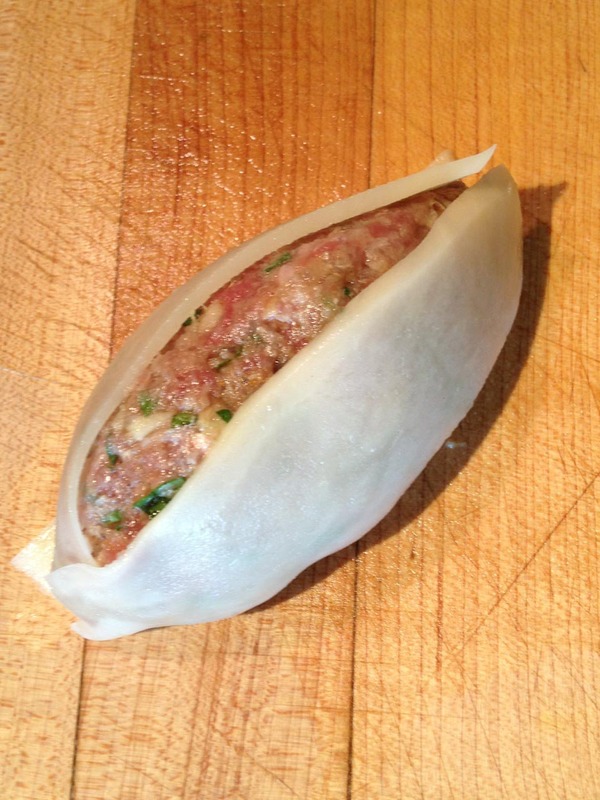 The curvature of their cuts would dictate the shape of their boulette. I figured out a simpler method that yields a more consistent wrap and saves literally hours of work. I use a mandoline to slice the potato into thin sheets, about 1/8-inch thick. The potato sheets need to be soaked in salt water for about five minutes to both season them and make them more pliable. Cut the potato sheets into strips that are approximately 3” long x 1” wide. This doesn’t have to be perfect, but trimming up the strips makes for easier assembly. The chunk trimmings from the potatoes can get thrown into the simmering broth. Do not waste! 5. Before assembling the boulettes, prepare breading and frying “stations” so you are ready to go after the meatballs have been formed. In one bowl, beat three eggs, ¼ cup of water and a pinch of salt. Put about 2 cups of all-purpose flour in another wide, shallow bowl somewhere close to your stove. 6. Remove the meat mixture from the refrigerator and lay it out with your potato strips next to your workstation. To form the boulette, take about 2 ounces of meat (slightly smaller than a billiard ball’s worth) and form it into a torpedo shape, about 3 inches long. Then take a strip of damp potato, lay it on the meatball lengthwise and press it in slightly so that it adheres to the meat. Apply two more potato strips, leaving about a ¼-inch of meat ball exposed between strips. 7. Prepare a large, shallow pan with a lid. 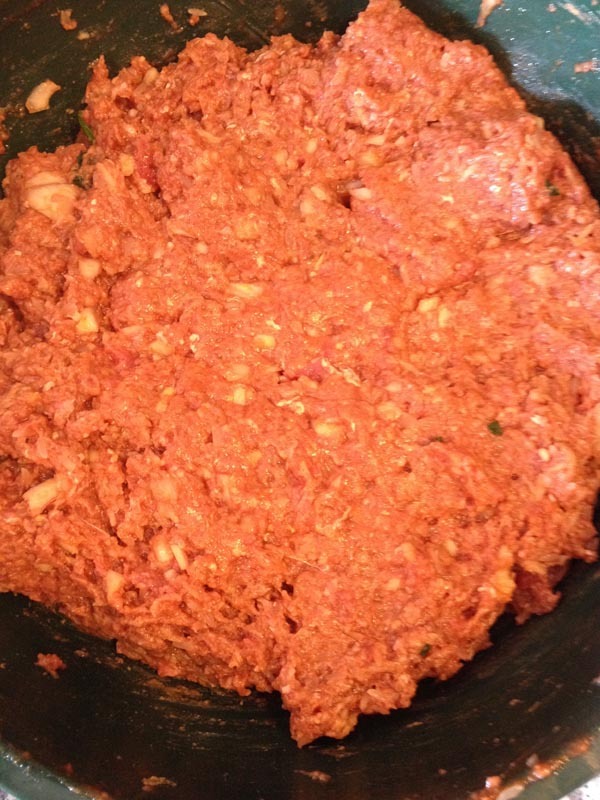 It needs to be about 16-18 inches wide in order to hold all of the boulettes at once for the braise. Heat ½ cup of olive oil over medium-high heat. Since pan size will vary, make sure there is a generous amount of olive oil. Working in 2-3 batches so the boulettes have room to brown (not steam) in the pan, coat each in flour (do not shake off too much of the excess flour), then dip it into the egg mixture and place it directly into the sauté pan. Pan should sizzle but not smoke when you add each one. Adjust heat as necessary. Continue to brown on all sides until golden brown. Remove, reserve. 8. 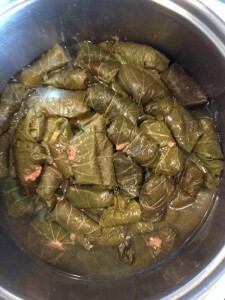 When finished, add them all back to the pan so they are packed in fairly snugly – touching, but all in a single layer. Add all residual juices as well. Turn heat to medium-high and as soon as they start sizzling, add about 1½ cups of the stew broth directly into the pan. The liquid should come about ¼-inch up the side. Reduce the heat to medium-low and simmer partially covered, until the liquid has reduced to a deep mahogany “gravy” – about one hour, maybe slightly longer. This is the part of the process where you need to have faith, or temporarily adopt it if you don’t already have some. The first time you do this, you will not believe that the the meatballs are going to stay together, and you definitely won’t believe that the potato wrapper will remain attached through the braise, but boulettes are small miracles both in engineering and flavor. Do not fret! At this point most of the hard work is done. Your broth is starting to taste really good. This is also a good time to take a break. Clean up your kitchen, have a glass of wine or a smoke. When you come back, you’ll start the final phases of couscous – vegetables, legumes and condiments! 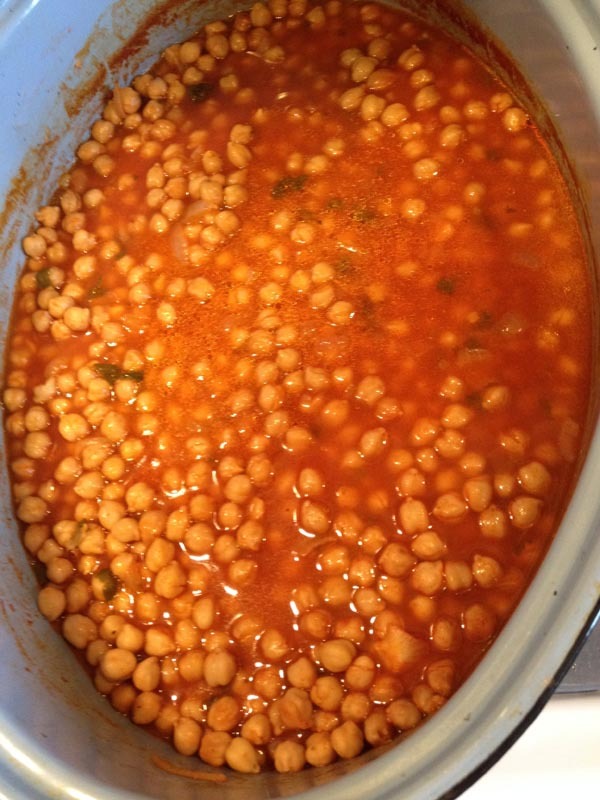 Take a can of chickpeas and ladle most of the beef fat that has surfaced on the stew over the chickpeas. Simmer for about an hour. The chickpeas will absorb the flavor of from the spiced fat. 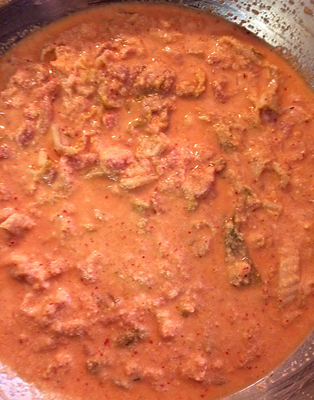 Before serving add the juice of one lemon, a tablespoon of harissa and salt to taste. The two condiments involved are harissa, a Tunisian hot pepper sauce, and a totally made-up parsley sauce that I improvised a few years back. 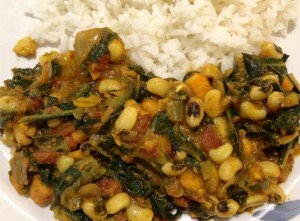 The latter adds back a little freshness and acidity to the final dish and the former provides spice and richness. If you like it a little spicier, try leaving some of the seeds in the chiles. Traditionally, salty preserved lemons were always served alongside the meal. If you are using a food processor, which I recommend, make the parsley sauce first, and then you don’t even have to wash out the processor bowl before you begin the harissa. 1. 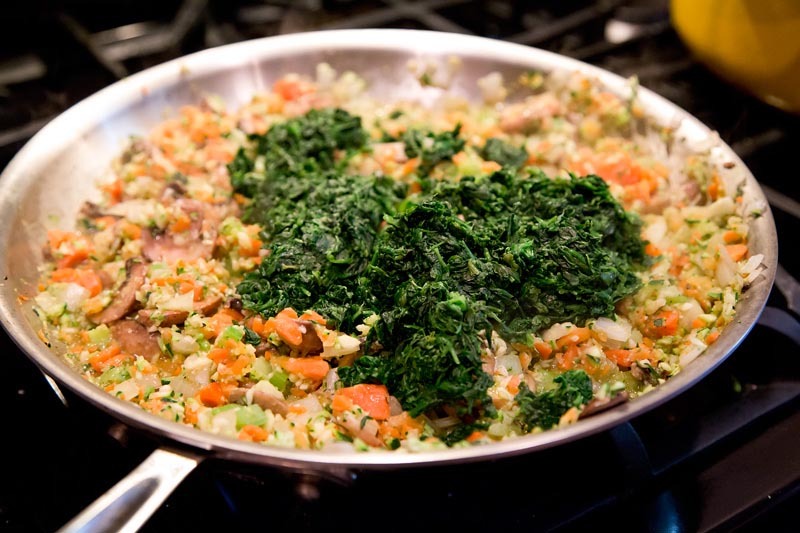 In a food processor or blender, combine parsley, garlic, olive oil and salt. Blend until smooth, add water until it makes a smooth and pourable sauce, about the consistency of a creamed soup – though a little chunky is fine. Cover and set aside. 2. Over medium heat, toast chile peppers in a dry skillet until fragrant and pliable, about five minutes. Also, heat the garlic cloves through, with their skins still on. in the same skillet. Meanwhile, bring about 1 cup of water to a boil. 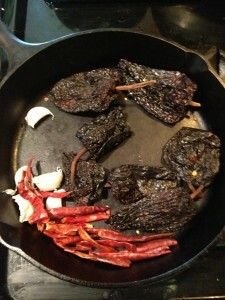 When chiles are toasted, cut them open with kitchen shears and remove the stems and seeds. Place the de-seeded chiles in the boiling water, turn off the heat and cover. Let steep 10 minutes. 3. In the bowl of the same food processor or blender you used to make the parsley sauce, add the chiles, peeled garlic, tomato paste, roasted red peppers, spices, salt, and vinegar. Blend until smooth. Taste and adjust for seasoning. Add olive oil to thin to desired consistency. Preheat the oven to 350° F. Place the couscous in a earthenware or ovenproof dish and pour the melted butter on top. 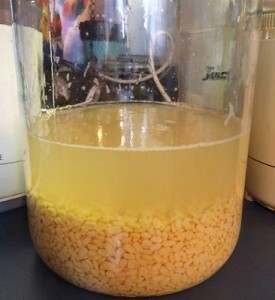 Massage the butter into the pasta until each granule is coated with fat. Heat 1 cup of water with 1 t. salt until very hot. Sprinkle this salty water over the buttered couscous to moisten the pasta. Place it in the oven to steam-roast. Check on its progress every 15 minutes or so, mixing and adding water if necessary. The couscous is done when it is soft enough to bite through, but it should still have some fight left in it. Using the whole-wheat couscous gives the dish a nuttier flavor, closer to the bulgur wheat that was used once upon on a time. It’s difficult to overcook. 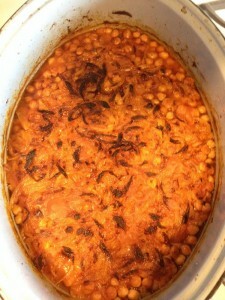 Once couscous is done (30-40 minutes), cover and keep warm in the oven. Transfer the stew to a large stockpot and bring to a boil. Remove short ribs and set aside for service. Taste the broth. It should be rich and slightly salty. Adjust seasoning. Add your vegetables and enough water to almost cover them. It’s okay if some of them are sticking out of the top of the liquid. Cover and boil until done, about 20-30 minutes. You do not want your vegetables to be toothsome; they should be very soft – cut-with-a-spoon soft. 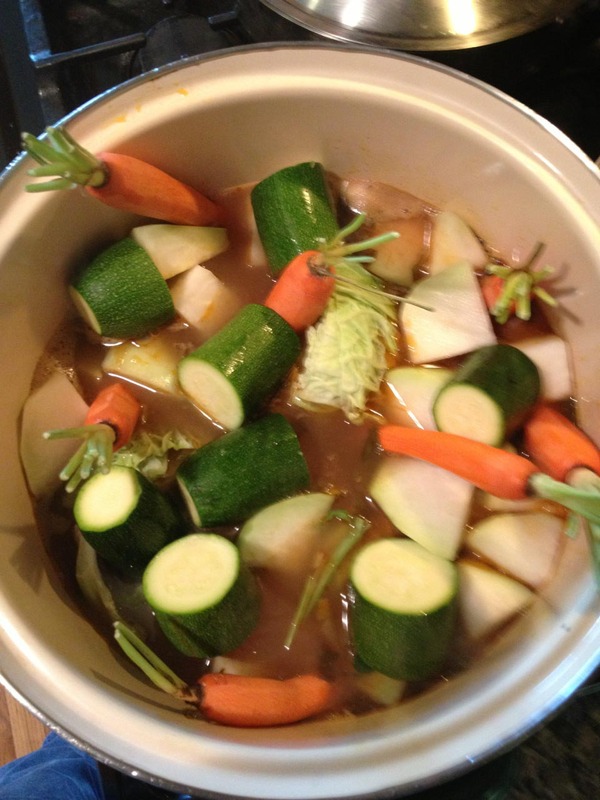 Let the vegetables rest in the broth until ready to serve. Re-adjust the seasoning to make sure the broth tastes like a savory soup. I feel sorry for anyone who didn’t grow up with some sort of boiled dinner – i.e. 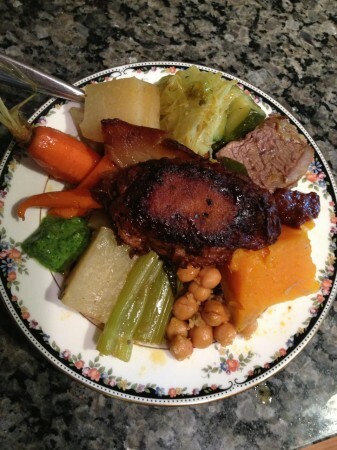 corned beef and cabbage, crawfish boils, pot au feu, cocido. As bland as they sound on paper, these are some of the most flavorful, soul-satisfying dishes imaginable. Couscous is no exception. Once the spices permeate the vegetables, they transform into something brand new. Remove the vegetables from the broth and lay out on a platter. 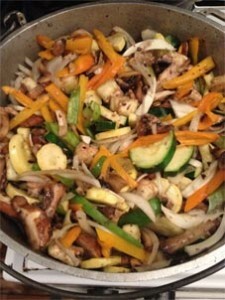 Drizzle a little olive oil over the vegetables and season with a few pinches of coarse salt. The broth can be served in a terrine so diners can moisten their bowls of couscous as they like. 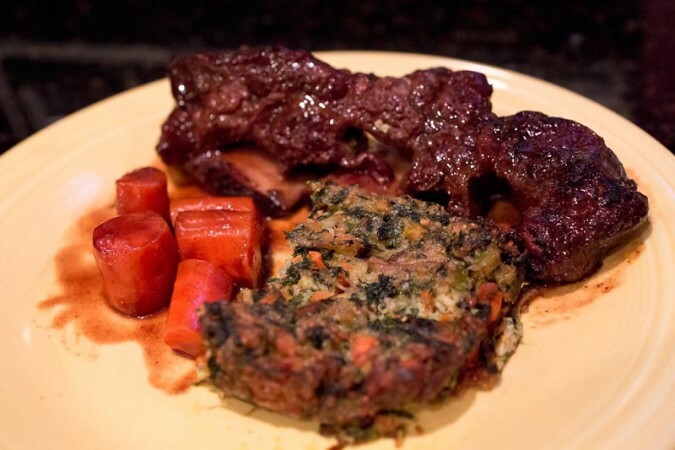 Trim and slice the short ribs and lay out on a platter with the shank meat and boulettes. In a wide, shallow bowl place a small mound of couscous. Moisten the couscous with ¼ cup of broth. Place a few pieces of each vegetable, chickpeas, short rib and a boulette on top. Garnish with parsley sauce and harissa and eat it in good health.